« Holy Cow! We Rang In The “Moo-Year” Like A Bunch Of Kids! Dairy Goddess! “What The Heck Is Fromage Blanc, Never Heard Of That Cheese”? Well here we are back in the swing of things as we start 2011. I have gotten back to the routine of my 5 farmers markets at the Central Coast. It feels good to have normalcy and routine. It is nice to see my customers and especially nice to see some sunshine. I also got to stop by Cal Poly SLO to visit Chica and “thank” her for her Christmas gift to me…yes a gift from a cow. I got to tell her how much I love it and how special it is to me. I got to share with her all of the lovely compliments I receive every time I wear it. 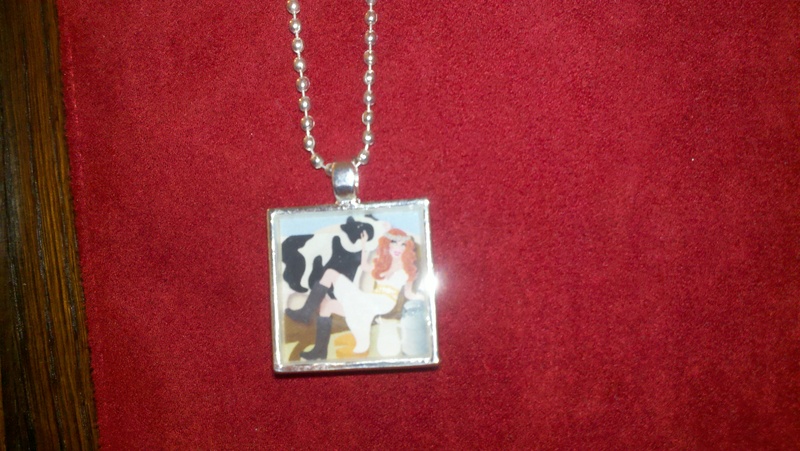 Everyone loves the beautiful pendant of Chica and I that is represented in my logo. This thoughtful gift was made possible by Dr Kathy Swift owner of www.cowartandmore.com She is a dear friend in my social media world. Not only is she a large vet in Florida but she designs and makes agriculture themed jewelry. She also showcases and sells other wonderful artists work that is also cow and agricultural based. Check out her website and see all the wonderful items she has. I like to visit to be “WOW’d” by her talent and those of the artists she represents. Fromage Blanc is a fresh, easy-to-make cheese. Of French origin, its name simply means “white cheese” and it makes an excellent cheese spread with herbs and spices added to it. It can also be used by itself as a substitute for cream cheese or ricotta in cooking. It can have the consistency of a cream cheese with a fraction of the calories and cholesterol. It can also be made to have the texture of sour cream or a thick drained yogurt. You can also make this with either whole or skim milk so you can make it as lean or as rich as you care to. Yes, it is quite the versatile cheese! Fromage Blanc is prepared in much the same way as Creme Fraiche, but is made with milk instead of cream for a lower fat food. It is also more tart in flavor then Creme Fraiche and can be softer in texture so it can be used as a topping for soups and fruits and in other similar ways. As mentioned above many folks compare Fromage Blanc to a drained or Greek style yogurt and often it is suggested as a replacement ingredient in recipes. Fromage Blanc is made from bacteria working at low temperatures and with a bit of rennet added (included in our Fromage Blanc cultures). The milk for this never goes above body temperature so it is great for folks wanting to retain the good things from raw milk. Yogurt on the other hand is made from a bacteria combo working at higher temperatures and no rennet is added. It also needs to be heated well beyond body temperature to 185-190F and thus destroying the natural flora and enzymes from raw milk. This is done to release the whey proteins which can then be used for better texture and food value in the yogurt. Quark is another cheese quite often compared to Fromage Blanc. It is not so common in the US but in Germany and the rest of Europe it is easily found and quite popular. This is very similar to the Fromage Blanc and made at similar lower temperatures. The bacteria that are used for this are more aromatic and no rennet is used. I love too that I see you several times a week in your Real CA milk commercial. We all cheer when we see you!! Love the pendant! Great job Kathy! Good luck with the class…it’s addictive! Let me know how it goes for you! Wow, what a great blog I stumpled upon! And as a French person, I can tell you that I love fromage blanc and I’m always disappointed not to be able to buy it anywhere. Thank you so much! I hope to be selling my Fromage Blanc statewide some day. For now Farmers Markets in the Central Coast and Central Valley. I LOVE that you blog of daily cow sightings…of course I see them everyday but never look for them in everyday places. GREAT idea. I am going to share with others. Good luck and keep in touch! Here is how I got started. It’s fun too! I lived in Holland for two years an fell in love with quark – then moved to france for six years and ditto for fromage blanc! They are very similar and both delicious and versatile. I am going to experiment with the fromage blanc recipes – also, what is mascarpone? Is it a similar product? Hi Peggy, thanks for sharing! Have fun with those fromage blanc recipes! It is very versatile. As far as Mascarpone, it is a yummy sweet cheese. Similar to a ricotta. I really haven’t met a cheese I did not like 🙂 Best to you! One of my favorite quick dinners involves marscapone. You can use ravioli w/either butternut squash or mushroom filling, and make a sauce of marscapone, cream, lemon juice, w/a bit of good aged Parmesan cheese, simply melted in a little olive oil. My husband fell in love w/fromage blanc which he mistook for yogurt in the French grocery. When he tasted it he realized his mistake, he was on a mission to find it at home, but couldn’t . I’ll now attempt to make my own. I also confused fromage blanc for some kind of yoghurt at the local supermarket here in Alsace. But it is lighter, fluffier and creamier. I just ate a bowl of it with vanilla chestnut paste stirred in (oh I do like these French markets) and it was delish! I disagree that it is like quark though, which is much more solid and thicker, like a cross between cream cheese and sour cream, and which suggests more savoury uses than sweet ones. I also would not say that Mascarpone is like ricotta, which has a grainy texture. Mascarpone is smooth and more like a whipped cream cheese in consistency. Nice page! Thank you 🙂 Your market sounds amazing!